We continuously invest in the safety of your building and provide products of the highest quality. 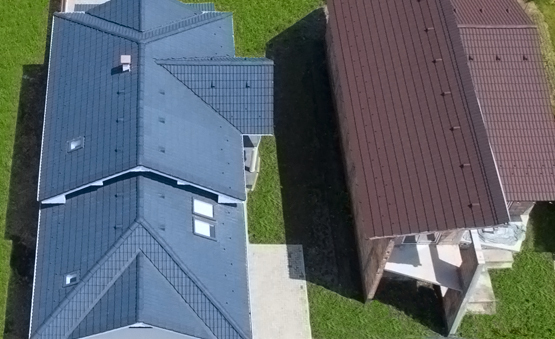 Concrete tiles have high resistance, and their shape is Double Roman. They are available in nine colors. Our company has been operating in the production of precast concrete since 2009. In our range of products you can find 20x50x20 bricks, 30x50x20 bricks, curbs, and paving stones of different colors and shapes. 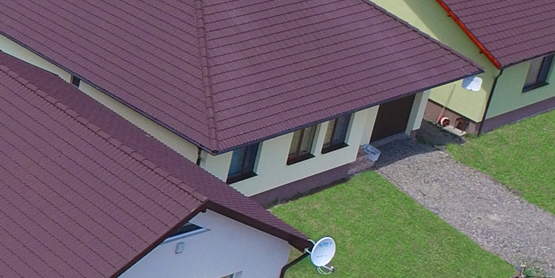 In 2014 we started producing concrete roof tiles. The concrete roof tile production line is based on the Vortex Hydra technology, from Italy. This technology was acquired from Tile Construct company and modernized with genuine parts. Since May of 2015, we have been including new models in the range of bricks: 20x20x20, 30x30x20, and 25x25x20. We also began to sell new models of paving stones. In the future, we plan to modernize the production line and to double the production capacity. 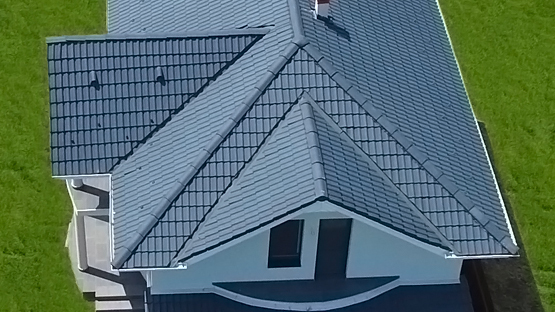 Our offer includes the following new products: tile, verge tile, ridge tiles, apexes, ventilation tiles. The modernization process includes the emergence of new elements into the production line. The Racker-Deracker replaces the manual handling of the semi-finished product and it sorts the wet tile on the maturation stands, which eventually reach the maturation room. The modern tile painting machine uses a newer technology which allows a more efficient usage of the paint and a better coverage of the tile. The automatic packaging and palletizing machine increases the quality of the products by reducing the manual handling of the final product. It lowers the manufacturing cost due to the efficient usage of the packaging materials. The following elements have been reconditioned and modernized: the supply conveyor, and the unit of shaping verge tiles and apexes. The production flow consists of five stages. The first one is the preparation of raw material in the mixer. Sand, cement, pigments, and water are inserted into the mixer. The concrete from the mixer reaches the shaping unit using a conveyor. The concrete is pressed in production molds in the shaping unit using shaping tools. The following step is tile demolding. After 24 hours in the production molds, the tile is removed from the maturation room using the stacker and it is manually introduced in the conveyor which supplies the demolding unit. Here, the tile is separated from the mold. The tiles reach the painting machine, where 35g of water-based paint is applied on every tile. After drying, the tiles are packaged and palletized. The packaging and palletizing process is manually done. Shrink foil and pp 16mm belt are used for packaging, and EUR pallets are used for palletizing.